Gold is adding to its gains from the Asian session last evening in impressive fashion as the climb today has been steady and methodical. It has all the appearances of a strong short squeeze accompanied by an inflow of new long positions, which is exactly what this market has been needing to propel it higher. If the specs start falling back in love with gold again, the rally will have further to run. It is not hurting things that the HUI is roaring higher today! It is up over 6.5% as I type these comments so gold is firing on both cylinders right now. 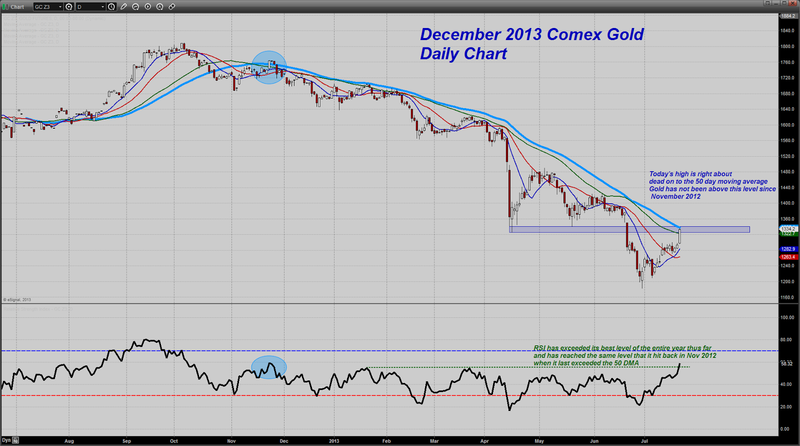 A quick take on the gold chart.... note that price has run exactly to match the downtrending 50 day moving average. That is a big level that the funds watch closely. Gold has not been above that key average the entire year and only briefly when it last poked its head above there back in November 2012. If the 50 day moving average cannot hold it, then we will see even more short covering with that hedge fund short position looking quite vulnerable. It is do or die time for those funds playing the metal from the short side. They either hold it here or they will be forced out. I included a graph of the RSI down below to show you that this is the strongest up move for gold this entire year based on this indicator. It has also matched the highest reading that occurred back in November of last year when it was last above the 50 day moving average. Combine these and it is evident that the metal has forged a bottom on the chart back at $1180. Now whether or not this thing can start a sustained uptrend is unclear but certainly, a strong push past that 50 DMA is going to take it much closer to so doing. I would also like to see the RSI exceed the 60-65 level and push up towards 70. Bear markets do not normally reach the 70 level. I noted a band of overhead horizontal chart resistance to show you that the market has now pushed into a region where technically, it can be expected to encounter selling pressure. If the bulls can absorb this, and thus far they are holding their own here about midway through today's New York session, then the bears are going to lose their grip. 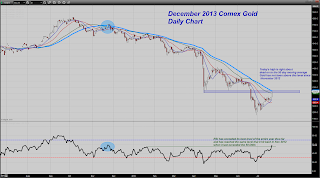 Silver has been pulled higher by gold and has pushed past stubborn resistance at $20. Further helping it along is strength in old crop soybeans which are being fueled by more talk of dryness. Grain bulls have been crying up too much water, not enough water, everything they can in order to convince the world that the crop is terminally dead once again. This may be the last gasp for soybean bulls however. If we get some moisture soon, then they are in trouble. If not, prices can run a bit higher but the fact remains that we are going to have a big crop this year and US soybeans are too expensive on the world market. It is domestic demand that is supporting the market for now. I am checking the price of gold, the US dollar Index but also the 10 Year Treasury. So far we have the usual correlation between gold and USD but IF the 10Y goes up again and reach a new high we could see gold really shooting up very hard and quickly and the dollar index going under 80. Bernanke had to change his mind following the rise of the 10Y that was seen as a NO-NO for the housing market and therefore the US economy. The USD was sacrificed for the sake of the housing market and this is why gold went up while the USD went down. However IF the 10Y goes up again, there would be a new way of thinking for large investors: Bernanke and Co. are not in control anymore and no speech from ANY FED's members will affect the price of gold because the game is over. Due to November's elections I expect more intervention from the FED but it won't, in my opinion, change anything except larger, wilder moves in gold and the USD. XAU/Gold ratio has made a series of higher highs and higher lows 3 times since bottoming about 20 days ago on June 26, which was a world record low of .0675. For reference, the all time high was recorded in 1996 with a ratio of .375, which means that this ratio has to increase by over 5 TIMES before the gold stocks get "overvalued" again. Thanks for your chart and commentary Dan. Your insight and analysis is so helpful in these strange and confusing markets. Do you happen to know offhand what silver's 50 DMA is? Nevermind, I found it on Turd's site. For anyone interested it is around $21.12. I guess it is time to FLEE!!!!!!!!!!! Where the gold is kept at JPM...Fire..Fire..Fire everywhere. Well, there you go. They needed more time to somehow come up with something..I got the ticket..a fire. Yeah, that should keep them off our backs awhile. Hi Dan,my only worry is look what happened just after it hit that point the last 3 times.It seemed to fall off rapidly. Yo Dan! Did you catch the double island structure on HUI today/last couple of weeks! Neat, just a hint we might see some interesting action in the miners. What I find funny with T.A is that you often come to the same conclusion, whatever indicators or tools you use. 1) Choice of fibonacci retracements. - 1327 was crossed very easily, so for now I will stop considering the possible move down 1805-1175 and its fibonacci retracements (1327 being the first retracement). I will take into the whole 1950-1175 move down and its fibonacci retracements which I mentionned in a previous chart. The first retracement is then 1360 $. - 1317 $ was crossed as well, so for the same reason I will also stop considering the move up from 300 to 1950 and its retracements, and I will focus on the move up from 750 to 1950 only. It seems more relevant, as we keep bouncing up and down on a weekly basis on its main levels. We bounced on its 62% level at 1205 $ (close, not intraday). That means the 1348 $ = 50% retracement is a resistance. So we already have 2 Fibo levels around 1350 $ area as targets / résistances. Then on the 2 day chart, the median of a fork is at 1346 $. Then on the daily chart, the median of the old red Andrew's fork is at 1342 $, and prices stopped right on it. Then again on the daily chart, we can trace a channel going down, linking the recent tops and bottoms. Guess what? The top of the channel is at 1336 $. So yes, careful, I think that the 1335-1345 is a very dangerous zone to for the bulls, likely to generate a short-term correction. Long-term, I will feed definitely happier once I see 1348 $ give way. But the signs that a bottom is in are encouraging, and may drive the bulls out of their holes. The ma20 is reversing up. I also find it significant that we went back above the previous lows of 1320 $ : we erased all the previous loss. So, optimism, but being once more very careful. I'm not buying Under a strong zone of resistance. Instead, using the daily chart, I see that there may be un upward channel forming. Also, the ema15 has served as a great support lately after we went through it. If prices correct and get close to this support zone, I'll go long once more. That would be around 1285 $. P.S : zoom on daily chart. of course the point of buying around 1290 is that you can put a stop loss under the ma20 if prices keep going down, have a good risk/reward and keep your losses low if you are wrong. As a short, this rule being also true, if I were a naughty gold bear (:)) I'd short right here at 1340, stop loss 1360 and hope for gold to resume its bear trend. We are both in a downtrend (red) and in an uptrend (blue). No idea who will win eventually. Support (short-term) = 19,50 area. No way I buy right now. Maybe if we go back to 19.50 area and it holds. "Gold rose today because those knowledgeable know the inevitability of the changing of the Comex contract, as it is today which calls for settlement in gold between contracting parties. There is no question this is the emancipation of physical gold from the fraud of no gold, paper gold. The emancipation will cause physical gold exchanges to take birth and to be the discovery mechanism for the price of gold. This is the end of the ability to use paper gold future contracts as a mechanism to make the gold price sing and dance at the will of the manipulators." "There is no reason why gold cannot move up hundreds of dollars a day when the Comex changes their spot contract settlement, as they must, as they will, very soon."